You know how Sony is showing its E3 press conference in select theaters around the country? Well, if you attend, you’ll get more than just the experience of watching on the big screen. Sony promised gifts…and one of those gifts was either revealed or leaked today. 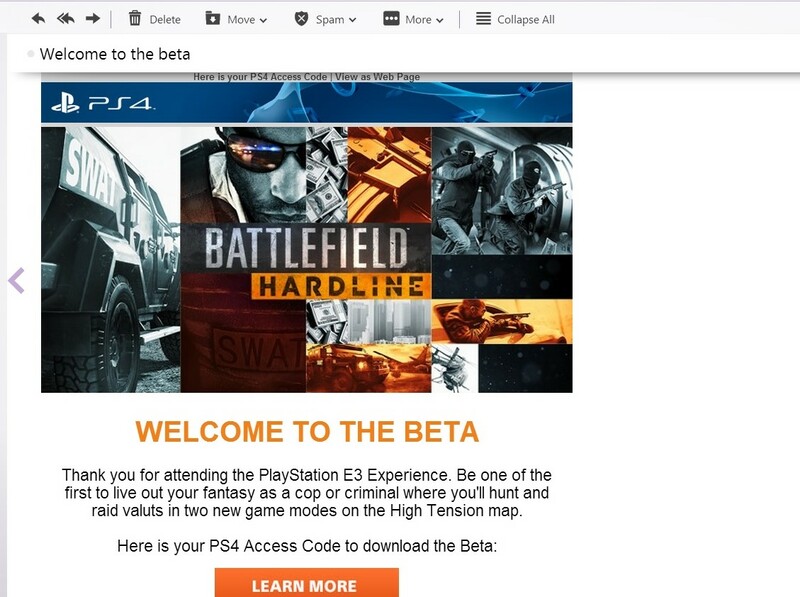 Fans who registered for the PlayStation E3 Experience received emails that thanked them for their attendance and gave them access to the beta for Battlefield Hardline, which was recently announced. Since the codes aren’t actually available to these users yet, we suspect the emails were sent out by mistake. Still, this is pretty cool, and we wonder if there are other surprise gifts planned. If you haven’t registered for this event and you want to, you’ll have found that all of the theaters are already sold out. There’s no guarantee that Sony will include more, but it’s been confirmed as a possibility. @rgamer42 I think they are looking into it. The response was incredible. We can’t wait to see what Sony has in store, and little bonuses like Battlefield beta access just make this idea all the more intriguing. E3 is almost here, but if you can’t wait until then for more news about the PS4 (and Vita), we’d like to let you know about PlayStation’s Summer Fireworks, an event planned for June 6th in Japan. It will involve footage from certain Vita games, details on upcoming PS4 games, and digital fireworks, and it will be streamed through Nico Nico. It might not be translated, though, so you might not get much out of it if you don’t know Japanese. We’re interested, though, in whether there will be a lot of overlap between games featured at this event and at E3.